I do believe this is a 100% Testor project, start to finish! 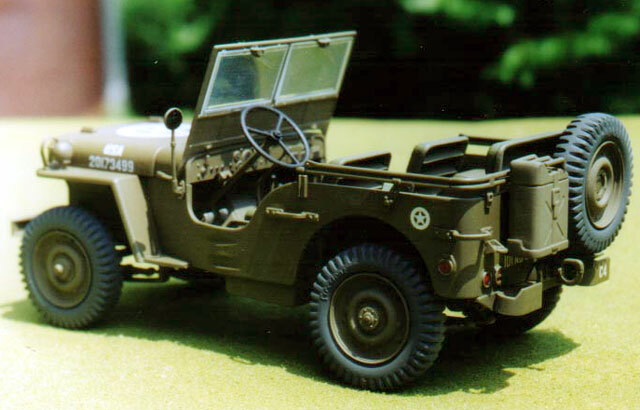 The kit is Testor’s early-1990s repackaging of Italeri’s 1/24 scale Willys MB Jeep. There sure seem to be a lot of fiddly little parts in the box, but the kit goes together exactly as advertised with no hassles whatsoever. Just take your time and assemble everything according to the instructions. It looks like a Jeep when it is finished, too. I don’t ask more from a kit than that! 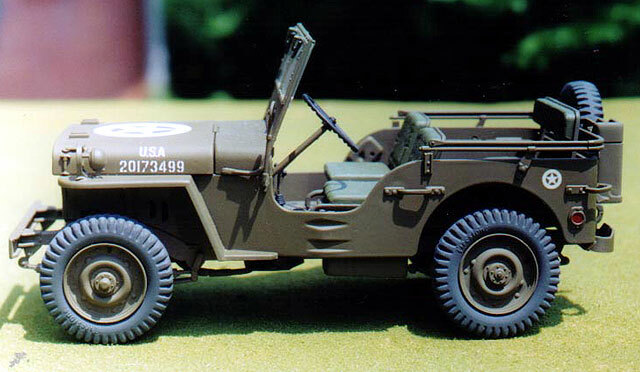 Nearly everything on the WWII Jeeps was Olive Drab--chassis, suspension, engine, everything. I airbrushed my model in Model Master FS34087 Olive Drab. The assembled chassis and the underside of the body were painted before the two were mated, just to make sure that Olive Drab got into all the nooks and crannies. I airbrushed the painted body with either Testor Glosscote or Model Master Clear Gloss (I don’t remember which; I use both extensively), taking care to get a smooth, glossy finish in the areas where the decals would go. The kit decals were applied and set with Model Master Decal Set, topped with another layer of clear gloss to seal them, and then the entire body was shot with Testor Dullcote. Just for contrast and some visual interest, I hand-brushed all the seat padding with a different shade. In this case I used Model Master Field Green. Instrument faces, dashboard placards, and other small details in the interior were picked out in Model Master Black Chrome Trim, as were the radiator hoses. Headlights are Testor Chrome Silver, and the taillights and side markers are Model Master Stop Light Red metallic. I airbrushed the wheels MM Olive Drab, masked them off, and then painted the tires with my own mix of “tire black” which consists of MM Flat Black with a healthy dollop of whatever shade of flat gray I happen to have handy at the moment. The tread area of the mounted tires was airbrushed with a medium gray, but the spare was left “tire black” overall to show it hasn’t been used. 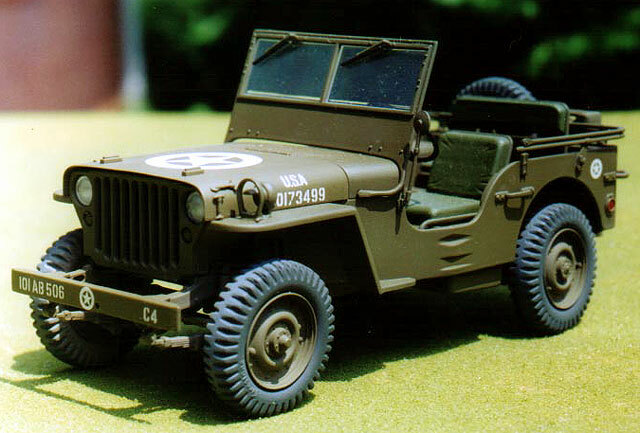 Weathering was kept to a minimum to represent a vehicle in light use, or perhaps a restored Jeep. I put a few drops of Model Master 30219 Dark Tan into a bottle of thinned Testor Dullcote, and airbrushed this mix on the underside of the model to show a dusty appearance. This mix is easy to use, and can be applied slowly, in layers, until you’ve built up just the degree of “use” you want to show. I also dry-brushed a few bare metal scratches on the floorboards with Model Master Aluminum. The M1 Carbine shown in one photo is from the AMT 1/25 ‘78 Dodge police car (the “Batman Joker Goon Car,” to be specific about the issue). The Testor/Italeri Jeep was a fun and easy build, and provides a perfect bridge in my collection between cars and armor. I recommend the kit highly, in any of its several boxings. I have another one that I have considered converting into a street rod. 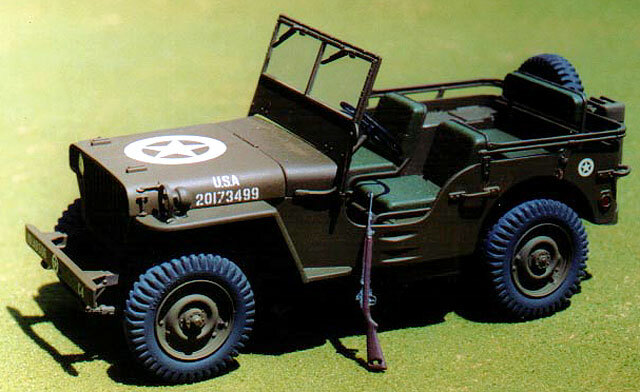 I do wish that Italeri would get around to kitting a version with the “Ma Deuce” .50-caliber machine gun--I’d buy that Jeep in a minute!